Build Mass and Muscle like never before! Gaining lean muscle is harder for some than others. So-called “hard gainers” have faster metabolisms, smaller appetites, and are “on the go” making it difficult to get the added calories and protein needed for muscle growth. 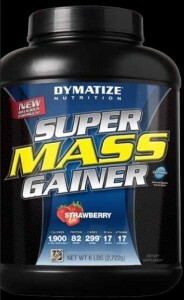 Dymatize’s Super Mass Gainer solves your calorie, protein, and convenience needs with a delicious formula designed to help you build mass and muscle.